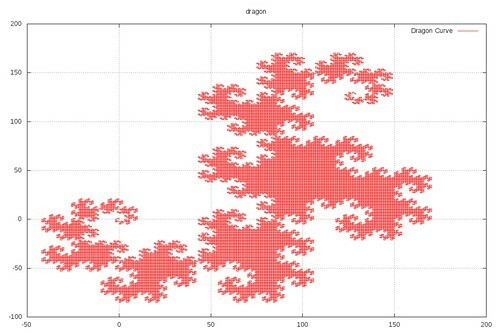 So I start by briefly explain what a Dragon Curve is. The best way to visualize it is to find a long strip of paper, and fold it in half (this is the first iteration). Then expand the paper and arrange the crease such that each of them is a 90 degree angle. Hence the first iteration is an L shape. Then fold the paper back, and fold once again from the middle in half at the same direction (second iteration). Then expand the paper and rearrange the creases into 90 degree angles again, then a new shape is generated. Repeat this as many times as possible, assuming papers can be easily folded after 6th / 7th iteration. The explanation is pretty bad, I know. Anyway, I give up on trying to explain and decide to directly post the solution. I actually re-used some new strategy picked up in the previous quiz. So I first generate a sequence of turns to determine whether to turn left or right for each step. return $current == $turns ? Then I generate the sequence by defining where the second point should go (assuming the first point is the origin in cartesian plane). return feof(STDIN) === FALSE ? In order to actually generate something to see, just call the chain of scripts as follows.